Bellarmine University's Newspaper, The Concord, started a new feature called "What the Locals Are Doing," and asked TVL to contribute for the inaugural installment. I join DJ and record shop owner Matt Anthony as we talk about what we're listening to (Matt) and eating (me.) My contributions include descriptions of a couple of my favorite menu items at two local places, and a shout-out to a neighborhood market I dearly love that is closing its doors for good next month. What the Locals Are Doing. Overcome with curiosity about Tony Boombozz's new Montanaro, "Louisville's "FIRST and ONLY fried pizza," we made a trip to the Taphouse at Bardstown and Eastern to try one. 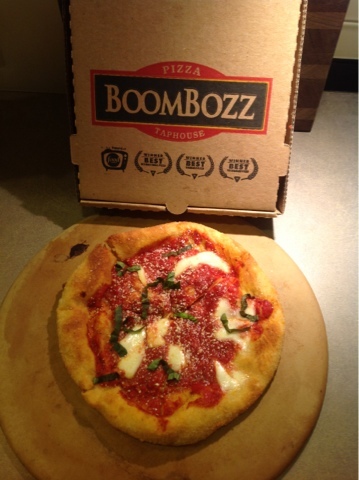 We really like Boombozz's pizzas, and I love how this location has a separate entrance, cash register and dedicated parking spots for takeout orders. They describe the Montanaro like this: "Not to be confused with deep-fried state fair fried creations, the authentic Italian pizza features a flash-fried crust that’s sauced, topped with fresh mozzarella a single topping and baked until crispy and golden." After reading that, relief washed over me. I had previously envisioned something that never should have been deep fried in the first place, like a candy bar or stick of butter, made more disgusting by a crust of icky oil and crunchy cholesterol. Thank God, I thought - not another monstrosity of whatever-the-hell, plunged into the deep fryer only to be pulled out and grimly displayed. This pizza is a delight. One of the most satisfyingly crisp and chewy crusts I've had in ages. The sauce has a little zip to it, and the dollops of fresh mozz provide creaminess. Strips of fresh basil and a dusting of parmesan cheese top the pie. Vampin' Lady True Confession: These pizzas are really just enough to serve one person, with maybe a piece left behind if you're not a huge eater. The first time we ordered the Montanaro, we did not know this. The second time, we got smart and ordered one for each of us. I made a simple salad to go with them, and it all made for a great dinner. I present the final four posts in Eater Louisville's 2012 year-end review. My biggest dining surprise of this past year? Finding drop-dead amazing food at a place dedicated to a beverage I am not even a huge fan of. I believe in the "When Everything's Right" Quotient - as Tom and Lorenzo call it, WERQ. 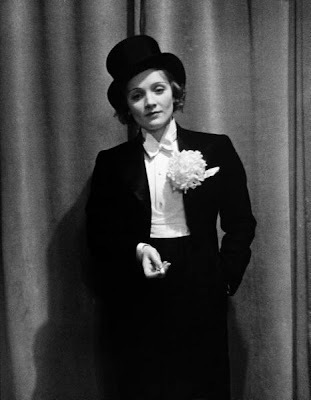 They use it to describe the way someone is WERQ-ing an ensemble of clothing, but to me, it can also apply to an experience Wherin Everything's Right. Such was the case during the night of My Single Best Meal of 2012. Now here's a saddie. We each had to give a restaurant we broke up with this year. I think the one I describe is super cool and fun to hang out at, but I just don't love the food. I predict, however, that it won't be a clean break. And finally, we predict restaurant trends for 2013. I actually went serious on this one. My other prediction would have been "dinner for breakfast." It's been fun looking back on 2012. Now that we've done this most important of duties, we can with clear heads and hearts look forward to 2013. Happy weekend, fellow Vampers. I hope you eat something crazy delicious, whether it's made by you, a friend, or a complete stranger. Today on Eater Louisville's year-end review, you can hear what we had to say about the best restaurant neighborhood in Louisville for 2012. I don't necessarily think it's the best all-time restaurant area in Louisville - only will tell. But I sure have had some slammin' meals there this year. We also talk about our biggest dining surprise of the year. In retrospect, a shameless plug for APRON, Inc., an organization I'm active with, might have been in order. I have been very pleasantly surprised by the outpouring of support from the dining community for our fledgling organization. Our mission is to provide temporary relief to folks in need who are employed by our local restaurants. We held a very successful fundraising event, done a "dine out" night at area restaurants, and received many individual donations, enabling us to make grants to a number of people already. Sum up 2012 in One Word. I've written about one of my top newcomers of 2012, and I probably should write about the other. The slow-braised beef cheek I had there nearly inspired me to compose a symphony. My one word maybe isn't technically one word, but if I say it fast enough, I can almost justify it. Eater Louisville asked me for my thoughts on the Louisville restaurant scene in 2012. You know I gots lots of thoughts. Check out Industry Experts on the Top Restaurant Standbys of 2012. Me and a bunch of other cool folks talk about which restaurants we returned to time and again over the past year. This post is the first in a series of posts for EL's 2012 year in review. Stay tuned... my answers to more burning questions are on the way through the end of the week. 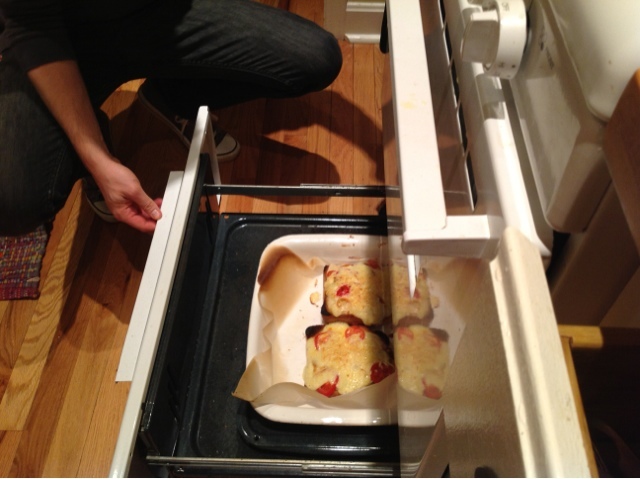 Genius can spring from necessity, as was the case during a recent home-cooked dinner with friends. That Vampin' Lady went on location to the home of great friends the Gidge and the Gidgestress to help them plow through the mountain of leftover Thanksgiving turkey that was occupying their freezer. It all started innocently enough. One evening, the Gidgestress and I were enjoying a cocktail at a favorite haunt, and she lamented that she felt buried in turkey. I wondered aloud if she had made hot browns with any of it. 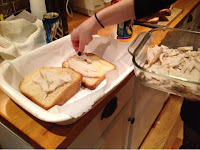 She thought maybe that would be a good thing to have people over and make. I blurted out "hot brown bar!" and the rest is history. The framework for the recipe came from the classic recipe for The Brown Hotel's hot brown. Proper Mornay sauce takes lots and lots of whisking. The idea was for all the ingredients to be set out on the counter, and each person would assemble their own personal hot brown. The Mornay sauce was the cause of some angst for the Gidgestress. It became clumpy right away, and so the first batch was abandoned, left for dead (see bonus photo at the end of this post.) Gidge took the wheel this time, as he is particularly adept at making béchamel sauces. 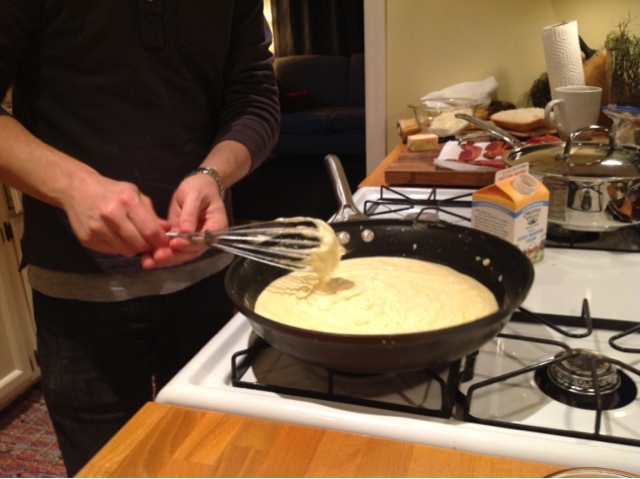 Don't you wish you had a husband who could rock a béchamel? In retrospect, both decided that had they continued on with the rest of the ingredients, the first batch likely would have been salvageable. 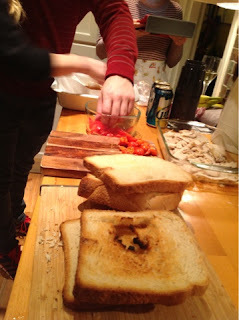 Gidge makes his own bread, so thick slices of it formed the foundation of the dish. Way better than Texas Toast, whatever that is. Vampin Lady True Confession: In a surprise blog twist, TVL did zero cooking for this meal. I sliced the little tomatoes I brought over, sipped wine, offered helpful commentary on how great the Mornay sauce was looking, ate the burnt black bits off the edges of the bacon, etc. 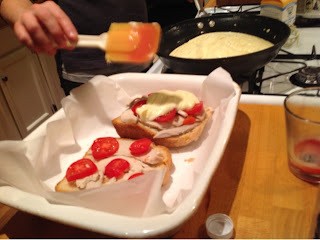 On went the turkey and tomatoes, and then the mornay got slathered on top, followed by a dump of pecorino romano cheese. The sandwiches went under the broiler for a few minutes, and once the cheese began to bubble up, out they came. Peek into the broiler... almost ready. Two slices of bacon went on top, along with a dusting of paprika and some minced fresh parsley. Lydio, another friend bellying up to the hot brown bar, assembled the first one. As you can see, the gods of cholesterol and triglycerides were smiling on us this night. This thing was prettier than a new set of snow tires. So beautiful, it hurts to look at it. 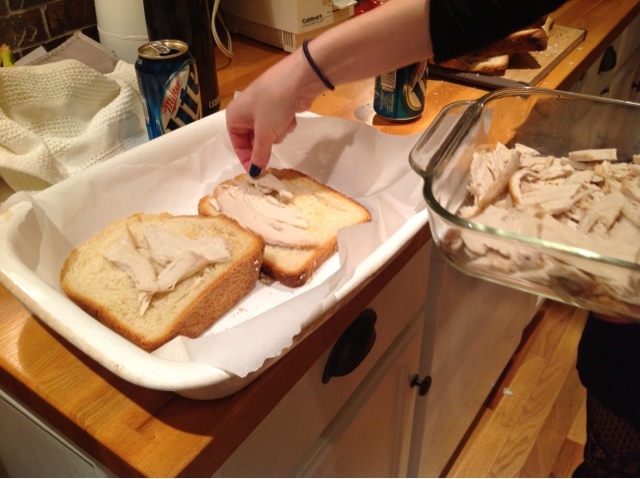 Without a doubt, we have discovered the best thing to do with leftover Thanksgiving turkey. 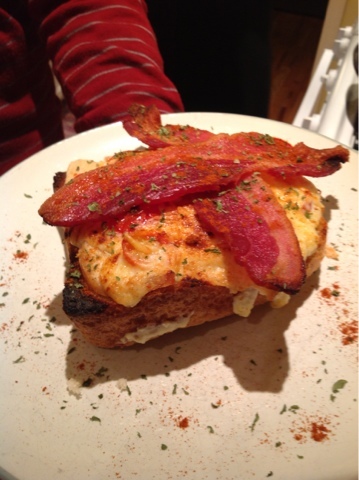 These hot browns looked and tasted spectacular. This party also had nog. Lydio is a champion nogmaker. You see, we all have our talents. 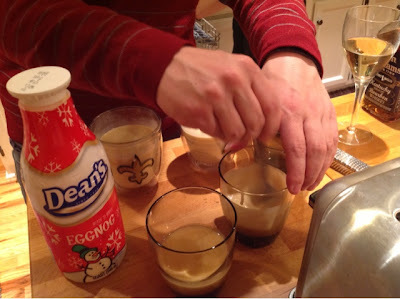 Nog... with bourbon and grated nutmeg. Vampin' Lady UnTrue Confession: After all that Mornay sauce, bacon and eggnog, we all rushed ourselves to the hospital for emergency angioplasties. Happy Hot Brown Days, y'all! 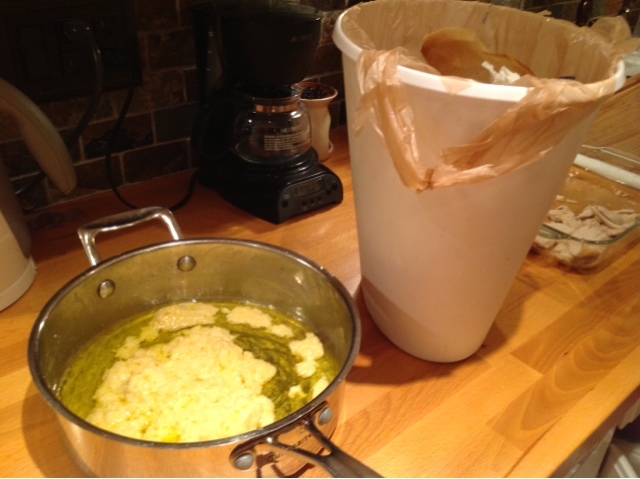 Clumpy Mornay sauce bound for the trash.